My parents were fortunate they didn't have to teach me how to cycle because my older cousin taught me, and incidentally, we were on a summer trip in Peking, Communist China, circa 1979. I taught my eldest how to bike. He hasn't stopped since. His bicycle is his best friend in Geneva. He goes around town, often alone, around the lake, or with me. I rent my bike for the day for free from the City of Geneva. Last time I rode a bike for the distance was with my husband to be, on Block Island, Massachusetts, circa 1997. Little did I know that my son would be my bike buddy, 15 years later! While I missed the younger ones I left home because they couldn't do the distance, the eldest said: "don't worry mommy, it will be their turn soon enough." We left the house at 230pm and I signed the bike off at 7pm. That meant we didn't get off the saddle for 4h30 mins! I stopped only to take photos and drink water. 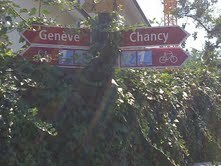 We rode through the city of Geneva and took a hill, to the outskirts of the city. I knew where we were heading, as Petit Lancy is the neighborhood I lived in for three never ending lonely years at boarding school. 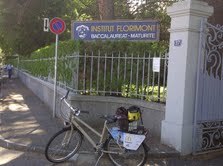 Florimont was on the bike route that was mapped up for us. 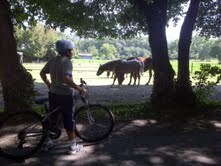 I cycled down memory lane, told my son I knew every nook and hook of the neighborhood and we cycled on, direction Onex. 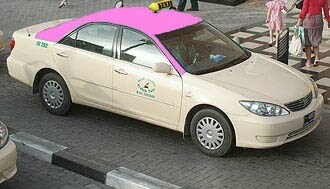 Onex is divided in two by a large avenue whose bus route I have taken. On the right hand of the avenue are all the "projects" housing. Shabby gray soviet style housing for lower income. I had traversed these safe neighborhoods to visit doctors or to take my kid to soccer camp. What I discovered today was the left hand side of the avenue. 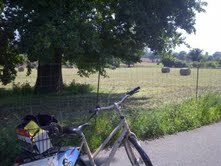 Pristine countryside and villages, at a two hour bike distance from the city. We passed hay stalks, horses and cows. We stopped at water fountains near churches. 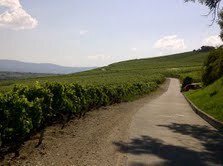 We discovered a road that bent between vineyards. My son rode up the hill the touch the sunflowers. Only eleven, he spoke of "swiss paradise". I thought he would complain and make us uturn home because the hills were steep and the distance far, but he wanted to complete the whole bike route and that is what we accomplished. A little under 40 kilometers and a great afternoon. I enjoyed learning when I was little using my cousins' bicycles We used to go on for hours until our little behinds ache.As an adult I bought 2 bicycles for my wife and myself,and spent a memorable autumn cycling on the C&O in Washington DC.That magnificent winding trail between the canal and the Potomac surrounded by the burnt colors of leaves will always stay in my memory lane. You are lucky to be able to ride in one of the most beautiful places in the world. T is correct in describing Geneva as a Swiss Paradise. Cycling is such an amazing sport. It's easy on the joints and can be done at any fitness level. I wish I'd taken it up earlier on, when I was a teenager and especially when I was at Stanford. At Stanford, 90 percent of the students owned a bike, as parking was difficult around campus and it happens to be one of the largest campuses in the US. But I was intimidated by my lack of skill and what I believed was a clumsiness that would embarass me in front of classmates. So instead I walked through the throngs of bikers zooming from class to class. It almost felt like communist China. Then when I married Dean, he laughed at my fear of bikes and pushed me to give it a try. Now I love our rides in East Hampton, the feel of the wind in our face as we ride fast, and the general levity of the sport. Now, as you well know, I am an avid spinner, and so I cycle indoors. It took me a little while to overcome my fear to try spinning classes too. But now I climb on those bikes and cannot explain how much I relish the freedom that the rides bring to me at the end of each session.